Into The Breach, the next game from the creators of FTL, is sort of like a cross between XCOM, Advance Wars, and FTL itself. But maybe it’s best described as beautiful kaiju chess. Here’s the premise: You, controlling a gang of three time-traveling mech pilots, must defend a cluster of islands from alien invaders. To do so, you embark upon a series of small turn-based battles, on randomly generated 8x8 grids full of aliens and obstacles. Your goals will vary from mission to mission, but your main task is always the same: Protect the buildings. Every time a building is damaged, you’ll take a hit to your power grid, which is essentially your overall health. That number sticks with you from battle to battle, so losing too many buildings in a single mission can leave you vulnerable in the next one. Once your power grid hits zero, you’re dead—you’ll have to start a brand new run, although you can select one pilot (along with his or her bonuses and levels) to go back in time with you for your next run. Battles unfold similarly to Advance Wars, but there are a few big twists. For one, you’ll always know what your enemies are going to do, because they’ll show you what they’re about to hit. Instead of trying to anticipate their attacks, you’ll have to find ways to stop those attacks from happening. If you know one spider-alien is about to assault a precious power plant, you can use a mech to push him one tile down, causing the alien’s attack to hit nothing but air. But if there are five aliens attacking, you’ll have to think creatively, because you only have three mechs. You can try to use multi-directional attacks to take out multiple aliens at once, you can put together creative combos, or you can make sacrifices in hopes of winning the larger battle. You’ll frequently feel outnumbered and hopeless, but with enough strategy and thought, there are usually ways to solve any problem. Because there are no XCOM-style probabilities, every attack will always work the way you expect it to work. By playing around with new abilities and manipulating the environment, you can build clever death machines. Once you get the hang of it, you’ll start feeling like a genius—at least until the next group of aliens crushes you. Each battle takes 5-10 minutes, and an entire campaign might take a couple of hours, as you try to get further and further each time you play (much like FTL). 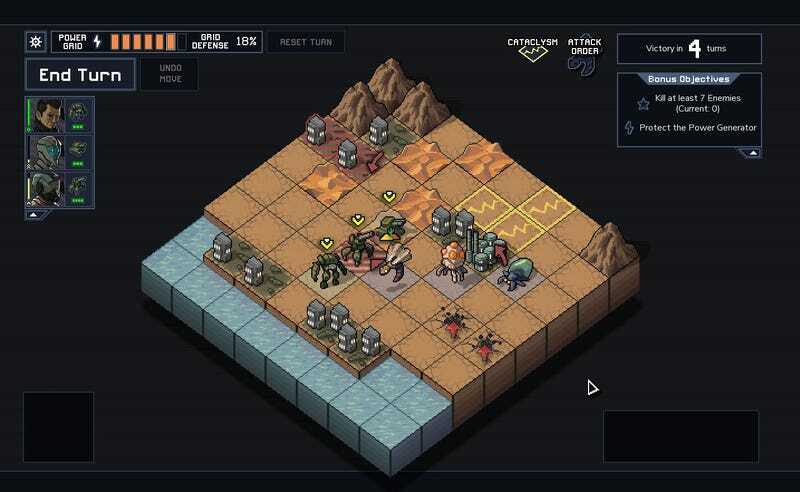 Into the Breach is out February 27 for PC, with Mac and Linux versions to follow. And yes, I know, everyone wants it to come to Switch. It’d be perfect there. I know.